The Phoenix R200 LGR Dehumidifier is another impressive unit from Phoenix. With a foot-print no larger than the R175, and weighing the same as its less powerful cousin this unit exceeds the water extraction capability of the R175 by 35%. The unit is protected from demanding environments by a tough roto-moulded housing and is designed to allow stacking above similar units to make efficient use of storage space for commercial operators. While optimized for water damage restoration the R200 will be an attractive unit for use in a host of other commercial and industrial applications. The Phoenix R200 LGR Dehumidifier provides everything offered by the R175 and more. It has a higher water extraction rate of 125 pints per day at AHAM testing conditions of 80°F and 60% relative humidity. This is achieved by use of a more advanced R410A refrigerant system and a high CFM-blower which processes 325 CFM as opposed to the R175's 230 CFM. This allows the R200 to deal with larger areas or to complete similar sized tasks more quickly. At saturation this unit will remove 26 gallons of moisture in 24 hours. 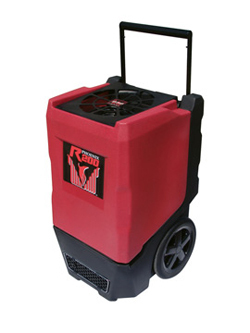 The R200 is a Low Grain Refrigerant dehumidifier which pre-cools the air before passing it over the condensation coils in order that more moisture is condensed from it. This is achieved without additional power which contributes to this unit's high energy efficiency. In operation this dehumidifier draws only 8.3amps. The operating temperature range of the R200 is also improved. The incorporation of Phoenix's patented bypass system extends the upper limit to 110°F while the use of an effective auto-defrost system enables the R200 to operate at temperatures as low as 33°F, effectively the lower limit for any refrigerant dehumidifier. Continuous drainage remains a straightforward process for the Phoenix R200 LGR Dehumidifier as a condensate pump is installed in the unit. If a suitable drain is not close by the pump will force the condensate vertically by as much as 20 feet to enable easy water disposal. The internal reservoir is automatically purged every four minutes and if for any reason this fails to happen the unit will stop automatically to avoid spillage. The reservoir can be purged manually through the control panel to empty the dehumidifier before transporting it to another location. The R200 is equipped with a 12 x 12 inch pleated media MERV-11 air filter which is easily replaceable. This provides a superior air filtration capability which both protects the dehumidifier, extending its working life, and provides superior air quality for those inside the drying space. Control of the unit is made simple by easy to use electronic controls, featuring solid state electronics for durability, which include an hour meter with which total hours and job hours may be separately recorded. The 25-foot power cord and 33-foot condensate hose are conveniently and securely stowed beneath the hinged lid at the top of the unit where they are easily available when needed. Multiple ducting options are provided with the R200 with 12” intake duct tabs on the lid and a wire duct collar for 10” lay-flat duct on the exhaust. The improved air flow of 325 CFM not only reduces drying times but provides superior static pressure for ducting. Despite all these improvements the overall package is as compact as its predecessor and shares its small foot-print of 20 x 20 inches and its height of 33.5 inches. At 105lb it is no heavier than the R175 yet boasts 35% more moisture removing capacity. For ease of movement on site the R200 has an integral telescoping handle which can be easily extracted and locked for use or stowed away as required. Two large robust wheels enable easy movement on site and the unit can be transferred to and from transport vehicles by a single operative if required. Naturally the R200 is easily portable with robust working parts designed to withstand the shocks and vibrations of movement within a vehicle. For added convenience in transit, and to make best use of storage space, the R200 is designed so that one unit will "nest" with another to allow a stable and convenient option to stack multiple units. The Phoenix R200 is designed to be durable enough for the demanding environment of water damage restoration. The unit benefits from a tough roto-molded high impact plastic housing which protects the dehumidifier from the inevitable impacts it will suffer. The housing is also designed to do the least possible damage to any object it comes into contact with and all edges are rounded for this purpose. The confidence of Phoenix in the R200 is demonstrated by the provision of a five year warranty on the unit. Year one covers 100% of parts and labor while years 2-5 include 100% of sealed refrigeration parts. The Phoenix R200 is a complete pacakage which will, no doubt, be very attractive to the water damage restoration professional.